Using custom and ‘wacky’ resolutions has been a thing in games such as CS:GO for a long time now, and the practice is gaining traction in the Fortnite world as well. In this guide we’ll explain the benefits of stretching your resolution, as well as how to actually use a stretched resolution in Fortnite. Using a stretched resolution stems from games such as Counter-Strike, where doing so makes the character models appear, well… stretched out. This makes the enemy player models larger on your screen and thus easier to aim and shoot at, or so the proponents of this technique say. Some claim that it’s the placebo effect doing its job while others claim that it actually is helpful. Additionally it’ll also increase your FPS, which is of course a logical reaction to lowering your resolution. This is perhaps one of the reasons many proponents of stretched resolutions say that ‘it just makes the game smoother.’ All of this isn’t without its drawbacks though. As Reddit user wictor1992 pointed out the two techniques don’t exactly work the same in both games. CS:GO actually stretches out the ‘frame’ of the screen it’s displaying in a stretched resolution, while Fortnite adds to your vertical FOV (Field Of View) in order to have it fit the display. This causes characters to actually appear smaller instead of bigger. An argument for this way of doing it in Fortnite is that the increased vertical vision helps keep an overview during building wars. So it’s obvious that there’s a lot of debate on whether or not you should stretch your resolution, but the fact remains that there is a portion of pro players who swear by using stretched resolutions, so who’s to say it can’t work for you as well? Might as well try it out, and that’s where the following part of this article comes in handy. 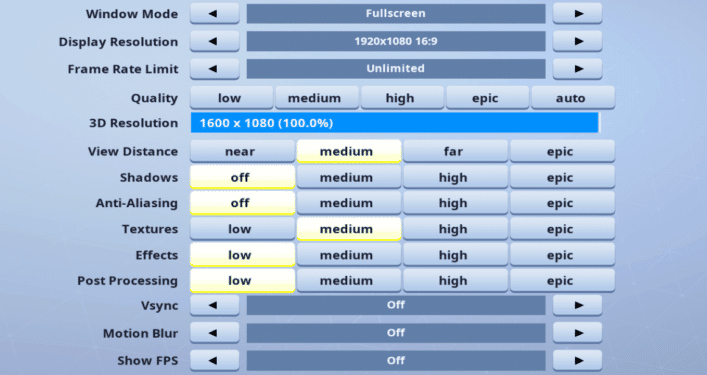 Make sure that your ingame display settings are set to fullscreen. All of the following steps will be for naught if you don’t have your game set to fullscreen. Go to your Fortnite config; press the Windows key + R, type in ‘%appdata%‘ and then go back a folder (to local) and click until you’re at \users\yourname\AppData\Local\FortniteGame\Saved\Config\WindowsClient where you’ll find a file called GameUserSettings. Open that file. Find ResolutionSizeX, ResolutionSizeY, LastConfirmedResolutionSizeX, and LastConfirmedResolutionSizeY. These should be near the top of the file. Change the numbers behind these entries to the desired resolution (e.g. 1440×1080 would mean you need to change both entries with an X at the end to 1440) and save the file. If you can’t edit the file then exit out, right click it, go to properties, and uncheck read only. Once you’re done editing the numbers, right click the file, go to properties and check read only. Then click apply. Once your custom resolution is made you should see it as an option in the customize screen. Check your custom resolution. Apart from Ninja & Tfue and a handful of other pro Fortnite players everybody seems to be playing on a stretched resolution right now. There’s a lot of debate on whether or not a custom stretched resolution increases the performance of your game (and the person playing it) but at least you now know how to try it out and see for yourself. Feel free to try out different configurations and see what works for you!